Redefining the relationship we have with our streets. Improvements on safety, accessibility and mobility can have a positive impact on the future of our community. In years past the idea was we Winnipegers needed to get from point A to point B as quickly as possible in our cars. Faster, easier and without the dreaded traffic jams. But were we correct in our thinking? When did one become dependant on the ownership of a car and what were we sacrificing. It wasn’t long ago we were planning for parking lots – not parks, parking spaces – not bike lanes, but there has been a shift in thinking. With the push for better transit options, more bike paths, safer and more inviting streets for pedestrians we are redefining the relationship between pedestrians, cyclists and cars. We are not alone! Other urban districts are joining the conversation or taking the lead and seen huge impacts in a positive way, Toronto Cycling Think & Do Tank has completed a series of studies examining cycling behaviour, social and civic infrastructure and cycling economies. Their 3rd study has great onsite for business owners and shows how important it is to be a part of the conversation, CYCLISTS, BIKE LANES AND ON-STREET PARKING: ECONOMIC IMPACTS. Winnipeg’s very own Active Transport Divison has taken great strides to improve infrastructure for cyclists and pedestrians and continue to perform studies to identify more potential projects. You can find maps of current routes and read more on their great work here, City of Winnipeg Public Works – Pedestrians and Cycling. Norwood Grove is awaiting their turn to have a review completed for new active transport enhancements! So what does this mean for Norwood Grove and the business community? Where do we measure up in today’s bikeable, walkable, community? Turns out we had some issues to address. Street parking limitations were inconsistent. We had limited main route bike paths or infrastructure. Street crossings for pedestrians presented high risks and hazards at a number of locations. Opportunity for seasonal expansions such as island patios were limited. Talk is great, but only if it takes action! The first task adopted by the Norwood Grove BIZ seemed simple at first, update the parking limitations to be consistent, but proved to be more of a challenge then expected. The process included a petition process that required the signatures of the property owners on the effect street, not the business owners (our members who were effected). Many businesses with in the focus area (Marion between Tache and Kenny) were not the property owners and connecting with them saw 3 years of failed attempts. Finally with the support of our Councillor Matt Allard, and signatures from all the businesses in support of the update, Council moved to make the change. With in that time Active Transportation approved a funding grant that allowed Norwood to install 40 bike racks throughout the zone. Two great steps forward. Reducing speeds on Marion and Goulet to improve safety for pedestrians and cyclists. Additional benefits is the option for island patios in summer, in parking lanes. 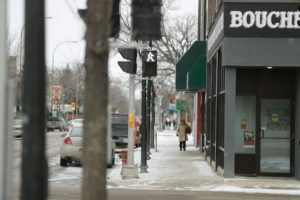 A study was completed by the city of Winnipeg with a recommendation adopted and passed by the Standing Policy Committee. However the motion was denied by the highway traffic board and is currently in appeal with the assistance and support of Councillor Matt Allard. An area overlay plan that addresses key intersections where crossings need improvements. Working in 2017 with ft3 Architecture and Landscaping a plan identified, crosswalks, bike lanes, bumpouts and more that will create a vibrant and safe pedestrian and cyclist environment. Improved bike parking, funding was allocated by Active Transport to continue to invest and improve bike storage and parking within Norwood. Safe Community Initiative, going one step beyond design the Safe Community Initiative builds relationships with local police and services in improve safety in Norwood. Working closely with local businesses the Initiative is still under development. Waterfront Development is a new focus with the recent approval to waterfront paths in the St Boniface community. New opportunities to connect and provide unique experiences. There is lots to do and when its done there will be more to come. Community development is ever growing and changing and we here at the Norwood Grove BIZ intend to continue to explore new trends, research and streetscape to ensure our community continues to thrive.